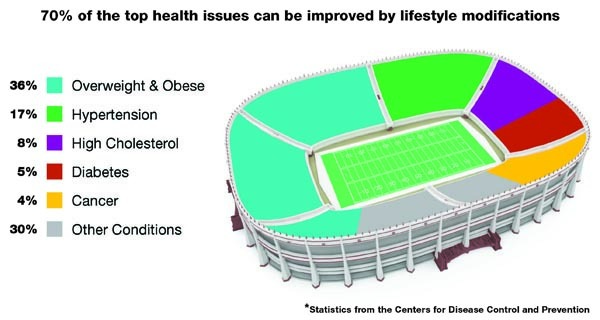 “If you looked at the health status of the fans in an average athletic arena, you may be surprised,” says Lauren Whitt, Ph.D., UAB’s wellness coordinator and an adjunct professor in the Department of Human Studies. “We can estimate that 70 percent of people in the stands will die from a chronic disease,” says Whitt, citing national health statistics. “If you want to move out of that crowd and get in the game of living well, you have to choose to be healthy. Think about what changes you are willing to make in order to stop being a spectator,” Whitt says. The most common chronic diseases are heart disease, stroke, cancer and diabetes, according to the Centers for Disease Control and Prevention, with obesity, high cholesterol, hypertension and inactivity all implicated as causes or contributing factors. Nearly one in two adults is living with at least one chronic disease. “The incredible component of chronic diseases is that many of them are preventable through lifestyle,” Whitt says. “You can make choices every day about nutrition and physical activity to prevent the onset of poor health. We often hear the excuse, ‘I don’t have time to exercise,’ but my question is, do you have time to face a life-threatening disease?” says Whitt. Whitt also suggests you have preventive screenings to alert you to changes in your health. And if you do have chronic conditions, adhere to your medication regimen and follow physician recommendations. “Being burdened with a chronic disease doesn’t have to be a part of your future,” Whitt explains.